SDT, the world's favourite Ultrasound Solutions company has done it again with another significant product release — their fourth in a span of 18 months. Fresh off the release of their award winning LUBExpert, an ultrasound solution designed to help Lubrication programs "Grease Bearings Right" SDT is pleased to announce the SDT340 data collector and UAS4.0. SDT340, together with UAS4.0, is a cloud connected condition monitoring solution that combines the power of ultrasound, vibration, temperature, and RPM in one diagnostic package. 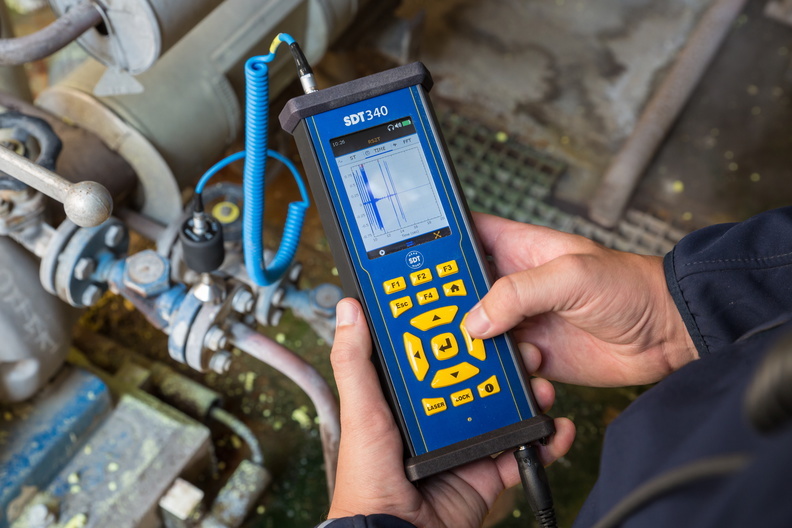 Ultrasound and vibration are the two most relevant indicators of asset condition; especially where the assessment of bearing and gear health are concerned. Both parameters are measured with crystal clear clarity using the SDT340's focUS Mode.Capture long data samples with 32K, 64K, 128K, or even 256K resolution. With focUS mode, find defects others simply cannot. Data acquisition time is adjustable from a few seconds up to 10 minutes. Inspect ultra slow speed systems or even machines that do not fully rotate. An internal storage of 4.5+ GBs means never having to worry about memory, or worse, fumbling for data storage cards. The large (3.5" diagonal) colour display works in split screen mode, recalls historical measurements, and displays the time waveform and spectrum with live, scalable X-Y axis. UAS4.0 is a scalable, multi-technology, multi-platform software to manage and analyze SDT340's data. Choose a stand-alone installation, a fully networkable server option, or host your asset condition data in the cloud. UAS4.0 breaks down the walls that previously isolated your Reliability initiatives. Custom adaptors allow data to flow seamlessly to UAS4.0 from other technologies, making it the central repository for your Asset Condition Information. Remove the silos and work as an effective team with UAS4.0 custom adapters. "One of our vision statements is to continue pushing the boundaries of ultrasound and condition monitoring while setting the example for our competitors to follow," exclaimed Allan Rienstra, Manager of International Business Development for SDT. "Our innovative products and rapid product refreshes continue to position SDT as the leader in Ultrasound technology." SDT's Managing Director, André DEGRAEVE, remains committed to family values and a simple approach to leadership. "Our development team is as strong as it's ever been. The complimentary skills of this dynamic team help us produce products that meet our customer's needs, while staying ahead of the technology curve field. No other company in the past five years has done as much to advance Ultrasound technology and condition based maintenance as my team." Declares a proud and satisfied DEGRAEVE.